Day 1: Let The Games Begin! **Note: For many of you, this may be your first time reading one of my trail journals. I usually do more background and prep posts about trails before the hike, but I ran out of time for the Great Divide Trail given all the other hikes I’ve been doing this season. There are a few pre hike posts you’ll find on my GDT tab. After the hike I will be doing my regular detailed posts with tips and advice for those planning for a GDT hike. For now, I will do my best to drop nuggets of info along the way as they come up. I can say that the GDTA website is a great resource! Also, I want to give a shout out to Zdenek Sychrava who hiked the GDT last year and has a wonderfully informative blog. Note that his GDT blog starts in week 6 on his journal since he did some of the Pacific Northwest Trail beforehand. He was very helpful and involved in our planning, so THANK YOU Zdenek! Oh it was glorious to wake up in a warm dry bed this morning while it was foggy, cold, and raining outside. We were in Babb, MT and just over an hour from the Canadian border. For those of you that missed it, E and myself just did a five day shakedown hike along the CDT to get to know each other and our routines. 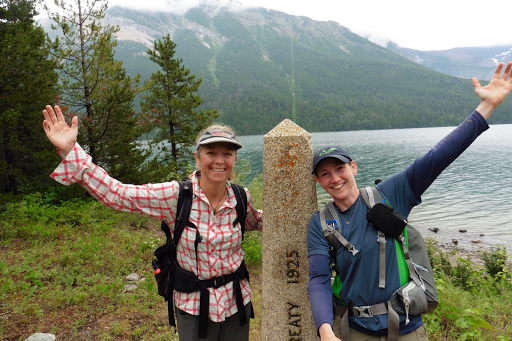 We met briefly on the CDT in 2013 and never hiked together. Today, we had a full day planned, which included some hiking, so we decided to wait out the rain a bit longer and left town around 10am. The border crossing went amazingly smooth. Just a few generic questions and we were through. They didn’t even notice all the resupply boxes we had piled up in the car to be sent out tomorrow. We were prepared for that to slow things up, but it didn’t. For those wondering, bear spray is legal to bring into Canada. The main thing we needed to be aware of was not to bring in any seeded fruits. 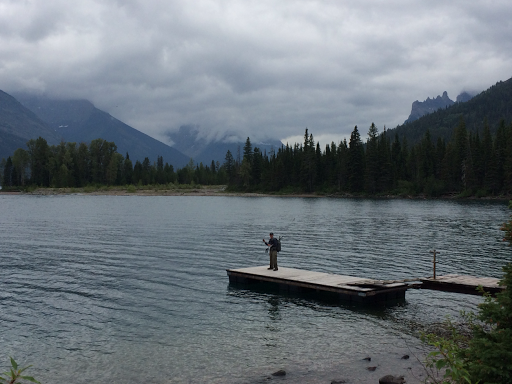 Soon after the border, we reached the entrance gate to Waterton Lakes National Park and were able to buy our Canada Annual Parks Pass. We will be passing through so many parks on this hike that it is worth it to get the Annual Pass. 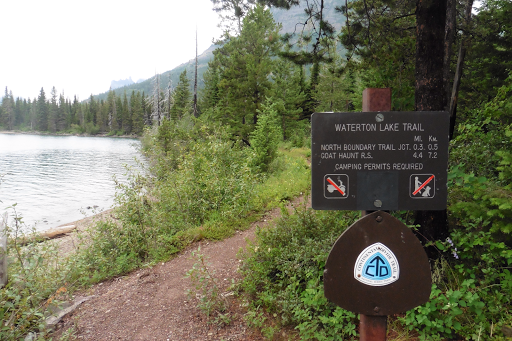 We are both familiar with Waterton, since it is the Northern Terminus of the Continental Divide Trail. 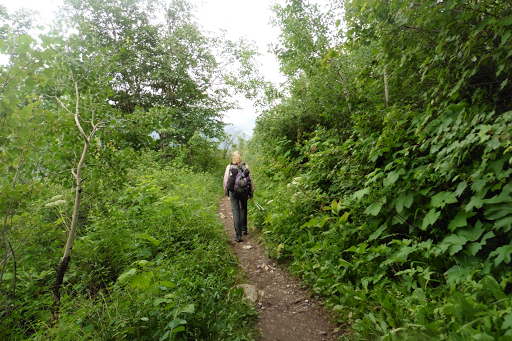 We had lunch and headed out to hike the 4mi/6km each way to the border and back to Waterton. Both of us have already done this stretch when we did the CDT, but we still wanted to tag the border and back and it was a total of 8mi/12km we needed to get out of the way to set us up for unpermitted camping this leg. It was my first slack pack (hiking without all your gear/supplies)! I never imagined slack packing, but this is the perfect situation. Never say never I guess. There are some high use trails around there and we saw plenty of people. Right when we started our stretch to head south to the border, we were on a half mile connector trail between two well traveled trails and it was immediately covered in brush, ha! This is so indicative of what we will be doing on the Great Divide Trail. 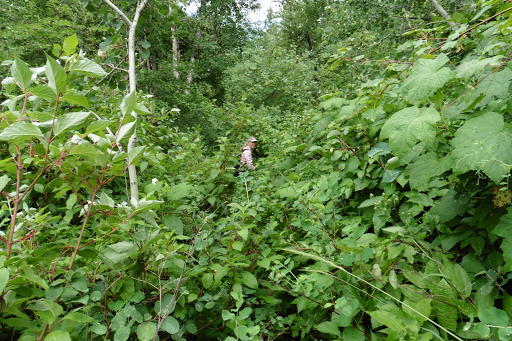 We will go through some great clear trails that are highly used and then there will be some others that are hardly used and very overgrown. With all the rain and it still misting a bit, our pants got absolutely soaked immediately. It was pretty amusing knowing that we have such stark contrasts ahead and it was evident right from the start. It did clear up quickly and it was smooth sailing down to the border. While we were in town over an hour earlier, I was driving and happened to notice two tourist that caught my eye. 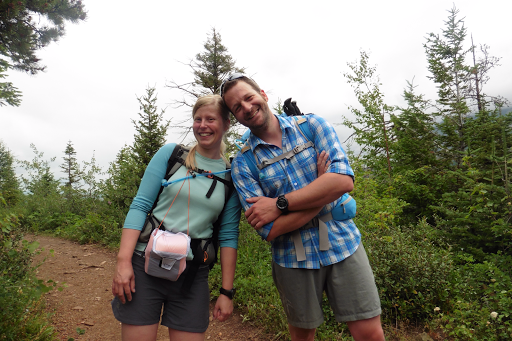 It was a couple wearing ultralight packs from Gossamer Gear and then now defunct GoLite. I pointed it out to E as we drove by and didn’t think much else of it. While we were hiking down to the border, we saw them again hiking towards us. I couln’t resist commenting on their packs and that they had the same light poles I do (Fizan hiking poles). The GDT is so uncommon that it didn’t even cross my mind that they might be thru hiking too. E asked if they were and they said yes! Our first GDTers on the first day! This is Laura and John from Switzerland. It was really fun to meet other GDTers, which may rarely happen. Including these two, I now know of 13 total hiking the trail and I’m sure there are a handful of others. That’s actually a record number for the GDT and it is growing quite a bit. There are a few that are starting around our time that we might meet, but the way this trail goes, we all have to book specific sites well ahead of time in certain areas. That has put us all on very specific itineraries to hit our dates at those sites, which is a new concept for all us hikers. Laura and John are technically two days ahead of us since we need to take tomorrow as a zero on a weekday to do more logistics before setting off. Their finish date is close enough to ours that we may still see each other. We shall see…just fun to meet them! We hiked on and reached the border. Such memories for both of us having been there two years ago. We had it to ourselves and took our time there soaking it in. Just LOVE IT!!! Offical start of the GDT at the Canada/US border. Notice the border swath up the mountain behind the monument. When I was last here, I was with Bloodbath and Rampage. So much was going on that I didn’t even realize there is a little dock next to the monument. E had spent hours there the day she finished. So great! Here is the trail heading south from the monument to begin the Continental Divide Trail southbound. Oh the memories! No one was there, so we had fun with the StickPic getting some monument photos. 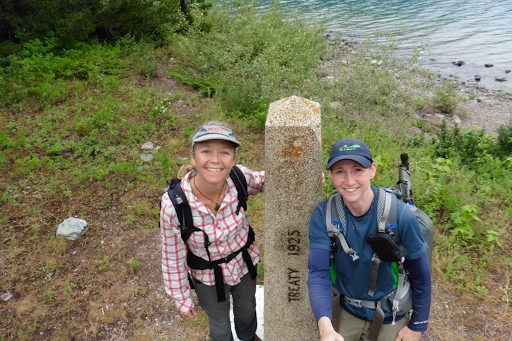 It still hasn’t quite hit us that we are officially starting the Great Divide Trail! It was more like a day hike back to CDT memories for both of us. We still have a day tomorrow that we need to get things done before we set off the day after tomorrow onto trail that is new to both of us. That’s when it will really set in that we’re hiking. As we hiked out, we saw our first major wildlife of the GDT. 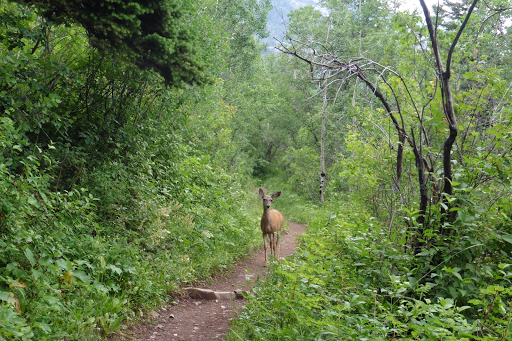 A greatly habituated deer that pretty much wanted to hike with us. The first of many major animal sightings I’m sure. Let the games begin! After we finished the hike, we drove an hour north to Coleman to drop off our resupply boxes at our first town stop. Mail in Canada is notorious for taking forever, so we thought it safest to just drop the first box off. We’ll see how the rest goes. We then drove 30mins back towards Waterton to stay the night at Pincher Creek where we can run errands tomorrow and get our phones setup for international use. We are at the Parkway Motel and I recommend it. Good deal and surprisingly cush compared to the outside appearance! Friends and family, I will NOT have my regular phone number during this hike, so don’t call or text. Email or fb messenger will be the best way to reach me. OH! One more thing…I have a tracker map so you can follow along and see where I’ll be. It is on my “Where’s Wired” tab. I’ve included it here for easy viewing. Notice the cool elevation chart too! I am kicking myself that I forgot to press the tracking button on my DeLorme InReach at the border, but you can zoom in on the map and see where it starts if you like. There is a satellite feature that looks even cooler if you select that in the drop down box on the right. The full KML file for the GDT can be downloaded if you’d like tracks for a GPS. Just go here on the GDTA website. Such a cool map to see each section, resupplies, side trails, campsites, etc. If you have trouble finding the KML file to download, you need to first go into the full screen version of the map and then click the share icon and it will give you the option to download the tracks. Here’s the cool map to follow along with my journey! I heard about the fires up there this summer. Such a bummer:( Good that the majority of the township was saved.